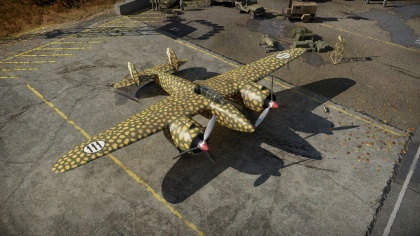 The Breda 88 (P.XI) is a Rank II Italian attacker with a battle rating of 2.0 (AB/SB) and 1.7 (RB). 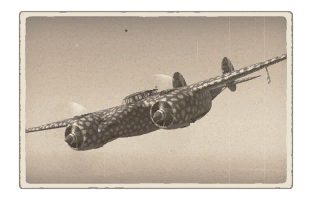 It was introduced in Update 1.69 "Regia Aeronautica". The three machine guns are arranged and located in the nose of the aircraft. Each is armed with different amounts of ammunition, which means that when all guns fire they will run empty at different times. The Breda Ba.88 (P.XI) should be used to attack ground targets. It can be difficult to be used as a heavy fighter as your pilot is extremely vulnerable. Try to avoid enemy planes if possible as any enemy plane that may engage you maybe fatal for the plane's crew. Also note this plane can carry bombs, but it does not have air brakes and it does not have a bomb sight, so you must manually slow down and estimate the payload release on target. Tremendous fuel load (33 minutes of fuel is the minimum). Reasonable armament with a high chance of igniting fuel tanks. Lack of armour or bulletproof glass for protection of crew. Poor roll rate, turn time, rate of climb and top speed. Plane is prone to pilot snipe. Does not have bomb sight. The Breda Ba.88 was a Italian heavy fighter bomber that was made for the Regia Aeronautica's 1936 requirement for a twin engine heavy fighter capable of 329 mph, 2000 km range, and capable of carrying 20 mm cannons. It made its debut around late 1936 to 1937 and during its evaluation it was a promising design. Standard firepower of the plane was three 12.7 mm Breda SAFAT Machine guns in the nose and a gunner in the dorsal turret with a 7.7 Breda SAFAT machine gun. The prototype aircraft flew with two Isotta-Fraschini K14 series while production models of the plane had two Piaggio P.XI RC.40 "Stella" 14-cylinder air-cooled radial capable of 1000 hp. By 1938-1939 the Breda Ba.88 came into production but it would be retired at 1941 with only 149 made. The reason why the plane was retired so soon was due to the plane's engines being under powered and it's heavy weight a critical shortcoming. This page was last edited on 3 April 2019, at 02:46.